Can Listening to Music Improve Your Workout? In particular, music that is motivational or synchronized with your exercise is shown to have physical and psychological effects. When a song has a strong, steady beat, for example, you can pedal or run to the beat of that music, which tends to feel satisfying and may inspire you to exercise more. The lyrics or catchy rhythm of motivational music inspires you to exercise longer or work harder during your exercise routine. Studies show that faster-paced music tends to help improve athletic performance when a person engages in low-to-moderate level exercise, either by increasing distance travelled, pace, or repetitions completed. For example, a 2006 study that looked at the effect of music on the selection of treadmill speed found that while listening to fast-paced music, participants increased their pace and distance travelled without becoming more tired. Other studies drew similar conclusions, suggesting that listening to music with more beats per minute can enhance physical performance during low-to-moderate level exercise. Several studies have shown how the exact tempo, as measured in beats per minute, affects one’s level of exercise. These studies determined that the ideal tempo necessary for maximum performance depends on the type of exercise. A 2011 study showed that in order to achieve the best performance for cycling (which was calculated by measuring exercise intensity through heart rate), the preferred tempo is between 125 and 140 beats per minute (bpm). A study published in 2014 showed that the best music tempo for enhanced performance on the treadmill is between 123 and 131 bpm. A plausible reason for why different types of exercise have different ideal tempos is related to one’s ability to keep time with the beat of the music, synchronizing strides or pedaling to the beat of the music. 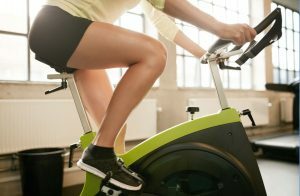 Since pace differs on the treadmill versus the exercise bike or elliptical, music of different tempos is needed to achieve ideal performance for various workouts. North and Hargreaves suggest that music distracts from pain endured during exercise through competing sensory stimuli, because it is easier to forget about pain or fatigue when a song you enjoy is distracting you. Music can lead to feelings of pleasure or displeasure, can change thought processes, and can cause changes in behavior. This psychological effect can be seen by physical changes in hormone levels. For example, a recent study showed that participants who listened to music they deemed “pleasing” had higher levels of serotonin, known as the “feel-good” hormone. Although difficult to prove the effects, this study suggests that the pleasurable experience of listening to a song can result in an increase in serotonin levels, which can put you in a better mood for your workout. Choosing music that you enjoy and that fits your exercise routine can help you get more out of your exercise experience. Since everyone has a different ideal workout pace and intensity, determining exactly what tempo works for you may be a trial-and-error process. With music or without, exercise is very important to overall health. See more on how to maximize your health here. Karageorghis, C.I., Priest, D.L., Williams, L.S., Hirani, R.M., Lannon, K.M., & Bates, B.J. (2010). Ergogenic and psychological effects of synchronous music during circuit-type exercise. Psychology of Sport and Exercise, 11(6), 551-559. Karageorghis, C.I., & Priest, D.L. (2012). Music in the Exercise Domain: A Review and Synthesis (part II). International Review of Sport and Exercise Psychology, 5(1), 67-84. Hodges, D.A. (2009) Bodily Responses to Music. In S. Hallam, I. Cross and M. Thaut (Eds.) The Oxford Handbook of Music Psychology, (pp. 121-130). New York: Oxford University Press. Tenenbaum G. A social-cognitive perspective of perceived exertion and exertion tolerance. In: Singer R.N., editor; Hausenblas H.A., Janelle C., editors.Handbook of sport psychology. New York: Wiley; 2001. pp. 810–822. Karageorghis, C. I., Jones, L., Priest, D. L., Akers, R. I., Clarke, A., Perry, J. M., et al.(2011). Revisiting the exercise heart rate-music tempo preference relationship. Research Quarterly for Exercise and Sport, 82, 274-284. Karageorghis, C. & Jones, L. (2014). On the stability and relevance of the exercise heart rate-music-tempo preference relationship. Psychology of Sport and Exercise, 15(3), 299-310. North, A. & Hargreaves, D. (2008). Music and Physical Health, In The Social and Applied Psychology of Music, pp. 301-311. Oxford: Oxford University Press. Altenmüller, E., & Schlaug, G. (2012). Music, brain, and health: Exploring biological foundations of music’s health effects. In R. A. R. MacDonald, G. Kreutz, & L. Mitchell (Eds. ), Music, health, and wellbeing, 12-24. New York: Oxford University Press.